"Hello, my name is Roary. Like all Lions, I have zero football talent whatsoever, but I do have a beautiful head of hair that demands respect in Detroit." Well, at least he's respected in Detroit....but then again, does that really count for anything? Someone needs to be embarrassed for this loss...I'm embarrassed that I jinxed the Packers with this terrible post. I suggest New England, New York and Chicago for starters! Also, can someone get a cushier brain bucket for A.R.? I mean we don't want him to sound like Troy Aikman do we? Having your roof cave in and playing a home game in Detroit is far more embarrassing. Bubbles is the real problem with that franchise. For those who don't know, the Lion logo on the side of the Lions' helmets is the silhouette or a real lion that lived a few decades ago. 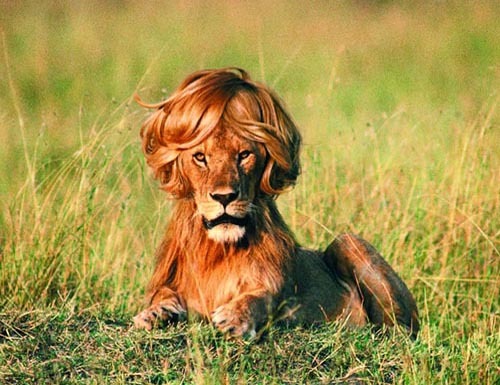 And that lion's name was Bubbles. "Bubbles" is just not a championship-quality name for a lion. And it has shown for many years. That's "...silhouette OF a real lion..."
Thanks, Ruppert. Between Roary and Bubbles, they are doomed to fail.